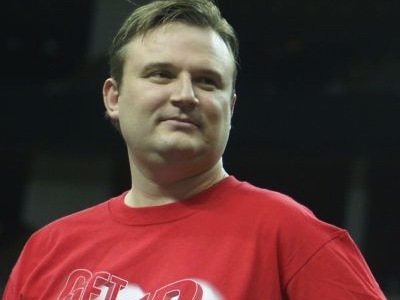 Major League Gaming just got a little sportier: Houston Rockets General Manager Daryl Morey is joining MLG’s board, the company announced today. For the past 11 years, MLG has built a business around e-sports — live and online videogame competitions. As the New York Times put it, the company wants to be “Both N.F.L. and ESPN,” meaning it acts as a hub for competitive gamers and as a packager of their competitions, through live events and online TV-esque video programs. Morey is an interesting addition to the executive team. He has one foot in the world of traditional sports, but grew up playing videogames; he rose to the Rockets GM job thanks in part to his focus on statistical analysis (think “Moneyball”) as a foundation for building a sports franchise. In an interview with AllThingsD, Morey said his son’s and his own interest in gaming, combined with his experience studying the science and structure of sporting leagues, got him interested in MLG. One of my first questions was whether he saw his role on the board as helping e-sports become more mainstream. He added that the professional “cyber-athlete” side of e-sports is “narrower,” but there’s room for growth. The growing prevalence of devices like smartphones and smart TVs opens up new commercial opportunities for gaming, Morey said. Currently, MLG’s mobile presence is a mixed bag. Communications SVP Katie Goldberg said 30 percent of the organization’s Web traffic comes from mobile devices, and that game-video broadcasts are mobile-friendly. However, MLG’s dedicated mobile app was discontinued last year and hasn’t yet been replaced. “We are ramping up our mobile offerings, and plan to release a new app by the end of the year,” Goldberg said. Morey also suggested that a greater emphasis on online video rather than live tournaments may be in the cards. “You need one big [live] event per year,” he said, although MLG currently runs several events. Otherwise, he added, broadcasting is where the “action” is.